Unless you didn’t already know, Instagram has a huge marketing potential and can increase your sales a lot – if used correctly. The simple reason to that is because that’s the place where people’s attention is. Where people’s attention is, brands can go, and ultimately impact those people, leading to sales. While the principle sounds really simple, there’s actually a lot to it, and you can’t expect to simply make a post telling people to “buy your products” and then drive sales. In this article, we’ll study the case if Instagram can drive sales to your brand, how you can increase sales with the platform with strong strategies, and lastly how to evaluate the results that you’ve driven. That Instagram helps drive sales have been proven time and time over, but it also helps you drive sales in a way that isn’t directly trackable and as easy to distinct as a direct result of your Instagram marketing efforts. 1.There are 8 million registered businesses using Instagram business profiles. 2. Instagram has 1 million monthly active advertisers—up from just 200,000 in March 2016. 3. In March 2017, over 120 million Instagrammers visited a website, got directions, called, emailed, or direct messaged to learn about a business based on an Instagram ad. And if Instagram wasn’t effective, brands wouldn’t use it. Simple as that. In 2017, 70.7% of U.S. companies will use Instagram for marketing. 60% of users say that they have learned about a product or service thanks to Instagram. While the statistics above sounds very promising, Instagram isn’t beneficial for all brands, and will not be able to drive sales to these. To identify if Instagram is suitable for you, taking a look at their users’ age demographics will help. Although they’re just an indication, it will give you some type of understanding whether or not Instagram marketing is for you. To be able to decide if Instagram is for you, and if your target audience is to be found on the platform, you need to be able to identify the age of them. What age group is your target audience? If you’re targeting individuals who are 90-95 years old, you might be out of luck as only 6% of Instagram’s users are 65+. 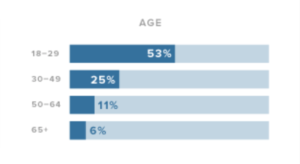 In contrast, if you are targeting people in the ages of 18-29, you have a much bigger chance of finding success on the platform as 53% of Instagram’s user base is within that age bracket. Now that we’ve sorted out which companies have the biggest chance of succeeding on Instagram, it’s time to take a look at what approaches you should have, and what strategies you should – and shouldn’t use in order to drive more sales with Instagram. If you’ve been using Instagram for a while, and I come across this on a regular basis. There’s a big chance you do too. There’s nothing wrong with engaging with your audience, but there’s a fine line between spam and acceptable self-promotion. And the reason to why these comments often are seen as spam is because they usually are made by bots. Brands who believe that all reach is good reach often take this approach. The spam-commenting method means leaving comments such as the ones in the examples above, in the hopes of getting followers and ultimately customers. While it might seem like a good idea to use this method, it often does more bad than good for your brand. First of all, because people are so familiar with these types of comments across Instagram, they often completely ignore them. Secondly, by leaving spam-comments, you display your brand as a spammer, and as a result, that’s how people will remember and think of your brand. It might surprise you, but by sharing more promotive content on Instagram, you won’t sell more. The fact is that it is a balance between sharing promotive content and content that provides value or shows your brand’s personality that is the recipe for success. Sharing too much promotional content can actually have a negative effect on your brand, so do not think for one second that you’ll sell more only because you post content of your products. 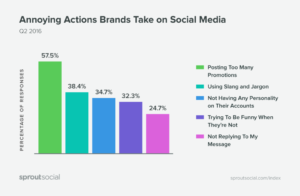 Let’s take a look at some statistics from SproutSocial that identifies annoying actions brands take on social media according to customers. As you can see, “Posting too many promotions” is the single most annoying thing, with 57.5% agreeing on this. 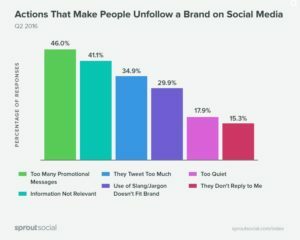 As you can see, 46% unfollow a brand when they post too many promotional messages, and as a brand, you want to retain your followers so that you can impact them to the point where they decide to buy your products. But do have in mind that the customer conversion is a process and not something that can be achieved quicker just because you share more of your promotional messages. In fact, as the statistics showed, it instead does the opposite and scares your potential customers away. If you want to drive sales on Instagram, you need to set up your profile properly, so that it includes a clear call to action, telling your audience where they can shop, contact information, a description of your business, and of course also a profile picture. To learn every single step to creating a killer profile on Instagram, read How to create the most appealing Instagram bios. Bio: First of all, you need to create an appealing and interesting Instagram bio with a clear call to action. When people visit your page, they should be able to instantly know what you want them to do, and be able to orient to that place. Website: You can implement one clickable website link in your profile, and when it comes to driving sales, it is critical that you use it. The easiest call to action you can have in your bio is a text that points people to visit the website. The bio and website link is very close to each other but if you want to be extra clear, you can even use an emoji that points on your website link. Profile picture: There are both direct sales and sales that have been generated thanks to trust, consistent engagement, and brand-awareness. Having your logo in your profile picture lets you build brand awareness, while also making it clear that you are a business. Because Instagram is a visually based, and drive platform, it’s important that you share high-quality content. It’s 2017! Nobody wants to see a blurry picture that looks like it was taken with a Nokia. Therefore, investing in a good camera is something that is almost essential if you want to succeed. Also, sharing higher-quality images than most of the other users on the platform lets you stand out from the crowd. Images that are brighter gets a higher engagement. Images with the dominant color being blue get 24% more likes than images that are predominantly red. Images with saturation generate 17% more likes than those with more vibrant colors. It’s impossible for a brand to reach every single one on social media, and in order to reach new audiences, while at the same time gaining trust and credibility, influencer marketing is the way to go. Influencer marketing is an industry that has exploded rapidly over the years. And with all right. Studies show that for every $1 invested in influencer marketing, brands get $6,5 back. If you haven’t heard the term before, it’s the use of influential people with a large following on social media, to spread a brand’s message. Because influencers are already trusted individuals within their niche, they tend to be more trusted than brands. In order for a successful influencer marketing to take place, you need to identify a suitable influencer, that is also price-worthy and have a high engagement. Because the influencer will decide a lot of the campaign’s success, it’s important that they’re laser-targeted for your brand. To identify influencers, you can use our influencer directory Veloce Network. Simply fill in your preferred criteria in the search filter and click search. It’s not only the images that are important. Captions are as well. Make sure that just like your profile bio have a clear call to action whenever necessary. And, most importantly, include all the necessary information. I see it all the time, brands who post a picture of their products. just to receive tens of questions regarding prices etc. but they never respond. This is a huge mistake that might cost them, several customers. Include all necessary information, but always answer people who comment as well. Once you’ve planned, executed and you’ve put effort into generating sales, you want to measure the results of those efforts. Doing so lets you see what type of content your audience resonate well with, and what type of content generates less good results. Once you’ve identified those things, you should cut them out from your strategy. A while back, measuring results on Instagram was difficult. Now, however, that has changed. With the introducing of Instagram’s built-in Analytics feature “Insight”, measuring how your posts and page performs is super easy. If you haven’t activated Instagram Insights, you need to turn it into a business account first and connect it with your Facebook business account. When you have made your Instagram account into an Instagram business account, you will get access to analytics. You can either look at the statistics of individual posts or look at the best performing posts. Did the top posts have anything in common, for example, dominant color, brightness etc.? The analytics also gives you information such as total impressions and profile views. Best of all is that it gives you information about how many people have clicked your website link, which might give an indication if people have shopped from your website. Related: The ultimate guide to using Instagram Insights. To access Insights, simply go to your Instagram profile and tap in the top right corner – or, if you want to see statistics on individual posts, go to that post and tap “view Insights” in the bottom left corner.